President Donald Trump's speech touched on the divisive issue of immigration, came as some 700,000 immigrants brought to the United States illegally as children, the so-called "Dreamers," risk losing their protected status while the White House and Congress square off over their fate. Washington, United States: Dozens of immigrants in legal limbo -- including a young teacher named America -- had front row seats for President Donald Trump's State of the Union address Tuesday, getting a close-up look at US history despite their own precarious status. 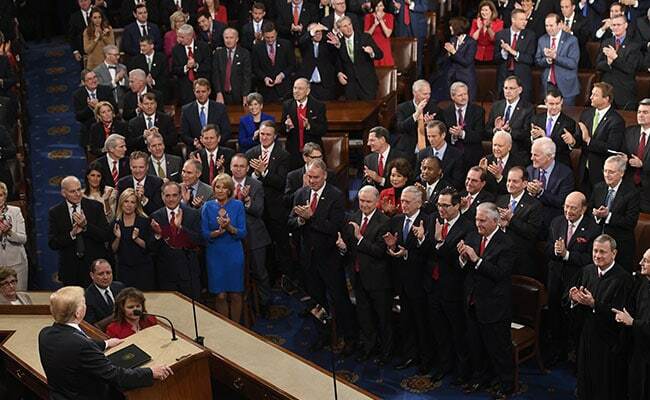 Trump delivered his primetime address in the hallowed House of Representatives chamber, where immigrants from Chile, Guatemala, Mexico and South Korea joined US lawmakers, top administration and military officials, Supreme Court justices and foreign ambassadors. The speech, which touched on the divisive issue of immigration, came as some 700,000 immigrants brought to the United States illegally as children, the so-called "Dreamers," risk losing their protected status while the White House and Congress square off over their fate. For those supporting the Dreamers, the goal of their presence was simple: "Make sure the president is seeing the faces of young people who are contributing to our community every day," said congresswoman Michelle Lujan Grisham. For America Moreno Jimenez, who immigrated from Mexico at age two with her parents and is now a public school teacher in North Carolina, it would be a very personal moment. "My name itself is a devotion to how much my family loves this country, and it's sad to see that nothing has been done yet," 24-year-old America told AFP, as congressman David Price, who invited her to the speech, stood nearby. "I want to hear a decisive statement, one way or the other," she said of Trump's speech. Trump was decisive, but not in the way she might have hoped, vowing to pursue immigration policies that focus on the "best interests of American workers and American families." "Americans are dreamers too," Trump said. Thousands of Dreamers like America will be under threat of deportation if Congress does not legislate a fix to the Deferred Action for Childhood Arrivals (DACA) program, which Trump scrapped last September and which expires on March 5. In a pointed message to the Republican president to break the immigration stalemate, more than two dozen Democratic lawmakers invited Dreamers to his speech. They "make America more American," top House Democrat Nancy Pelosi told Dreamers in the US Capitol. "You are the pride of America (and) you are here to stay." A Republican congressman from Arizona, Paul Gosar, contacted US Capitol Police urging them to check identifications at the speech and arrest "any illegal aliens" -- a move that infuriated Democratic lawmakers. "I would say to the congressman, you try it," boomed Texas congresswoman Sheila Jackson-Lee. Despite the tension, Dreamer Denea Joseph, a 23-year-old UCLA graduate who immigrated from Belize at age seven, hoped Trump would soothe the concerns of so many immigrants who were watching. A proposal recently outlined by Trump would put about 1.8 million of the 11 million undocumented immigrants currently in the country on a pathway to citizenship, provided they "meet education and work requirements and show good moral character." It would also provide funding for his border wall and severely curtail legal immigration. "I call upon all of us tonight to set aside our differences," Trump said as he discussed the sensitive issue. Several Dreamers wore yellow butterfly stickers, a nod to the insect's cross-border migratory patterns. Most have DACA permits, distributed under Barack Obama's administration, that provide legal residency and work authorization. But for many, the clock is ticking. Bolivian-born high schooler Nicolle Uria said she feels just as American as anyone else, but her DACA status lasts only through September. "Dreamers like me wake up every morning knowing we have an expiration date on our futures," she said.